Calgary’s two-way protected bike lane last week. Photos: Tom Thivener, unless noted. For dozens of newly built protected bike lanes across North America, it’s the season for one of their hardest tests: How are cities supposed to keep the damn things plowed? “We’ve put in a few projects that were narrower than a pickup truck, and those are the locations that just take forever to get plowed,” Chicago transportation planner Mike Amsden said in an interview. Obviously that’s not ideal, Amsden said, but it’s the situation. The need to fit maintenance vehicles in protected bike lanes is one of many factors that’s driven a recent boom in two-way protected bike lane designs. The design of these double lanes may be more complicated, but the maintenance is a snap. “Back when we were weighing a two-way cycle track on one road or two one-way cycle tracks on two parallel roads, our maintenance guys expressed a clear preference for the two-way cycle track because of the ability to get in with standard equipment and to have one facility to maintain instead of two,” said Tom Thivener, bicycle coordinator for the City of Calgary. It’s a difficult tradeoff for cities that see many days of snow in the winter: do you set an eight-foot minimum width for all protected lanes, to ensure that they can be plowed and swept promptly — but that protected lanes become much harder to build? 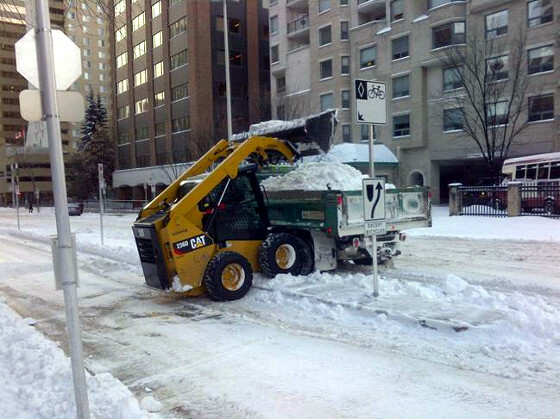 In a recent white paper on the subject of winter bikeway maintenance, Alta Planning and Design recommends setting aside six feet of roadway for snow storage if possible, in addition to the bike lane. 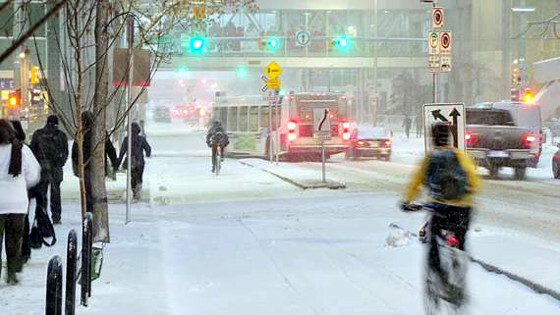 In Calgary, which has a long history of winter biking activism, the city has committed (despite some criticism from both sides) to clearing the snow from its 7th Street bike lanes “within 24 hours after the snow has stopped falling,” Thivener said. That’s the same standard it applies to off-street paths. The problem with that, he said, is that in Chicago, the law requires such a vehicle to be hauled to its destinations on a flatbed and then unloaded. “It is not cost efficient for multiple people to drive around the city carrying a piece of equipment,” he said. 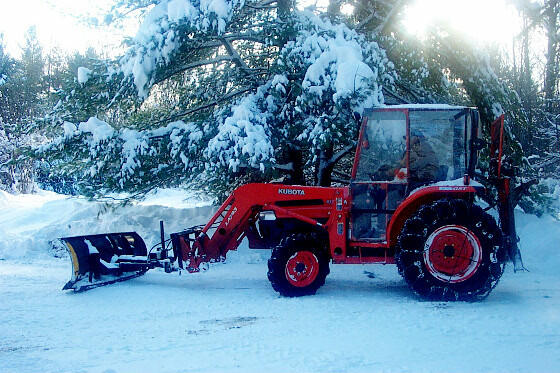 Where it’s possible, specialized equipment may be the best option. Chicago, Portland and Seattle have all rented or purchased 7.5-foot street sweepers that can be used on most protected bike lanes. Amsden said Chicago is looking for better ways to keep the streets clear while minimizing costs through measures such as coordinating its street-cleaning efforts, which are currently divided between multiple departments. “Every time it snows, we learn something that we didn’t know last time,” he said.